Win Subway® Gift Cards And Try The Footlong Faves Lineup! 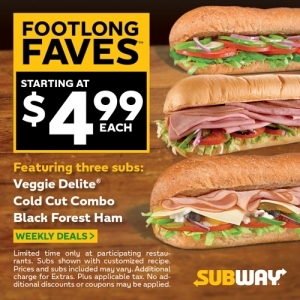 Head to your local participating Subway® restaurant today and check out the $4.99 Footlong Faves lineup! 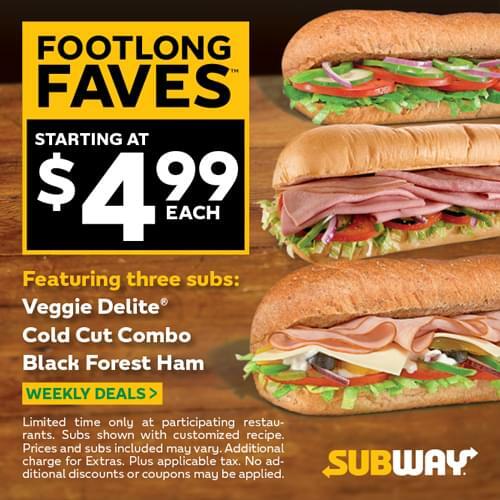 Choose from the delicious Black Forest Ham, crisp & fresh Veggie Delite, or the trio of meat stacked Cold Cut Combo all served on freshly baked bread with your choice of fresh veggies. For a limited time only! Make it what you want.™ Only at…Subway® Only at…Subway® ! Listen with ZYP to win your Subway® Gift Cards and try your very own Footlong Faves!